Sorry, I wish I was able to keep these in stock for immediate shipping but I cannot. There's no room left in my shop. Most of the molds are old and cranky, sort of like me, and take special care to produce quality castings. In order to have time and space for the new kits (esp. the Durango Roundhouse in 1/4") I must put other things aside. If you can be patient with me I would be happy to cast some of these for you- but it will be if and when I can. Current wait is running 2-4 weeks. These highly detailed stock castings range from standard common brick, hand-carved and fractured-face stones, to odd patterns of brick pavers, corrugated metal and plain old concrete. 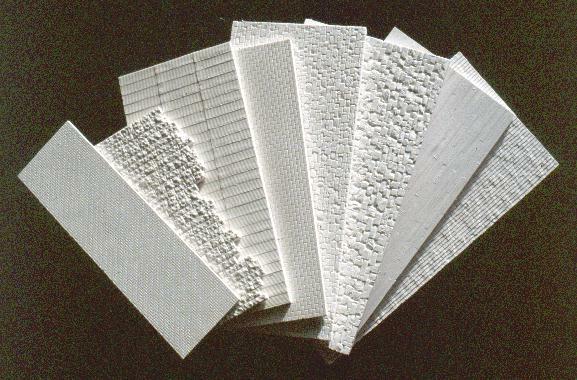 Not just plain, but cast with delicate forming board impressions. 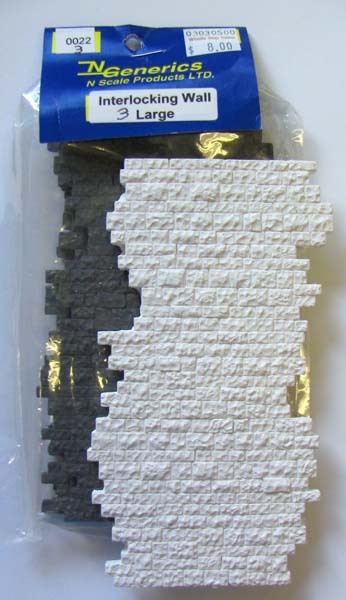 These are the finest masonry scratch-building components available. The precise hand-scribed patterns are faithfully reproduced in silicone rubber molds. They are cast in strong yet highly workable White Hydrocal. The backs are scraped flat in the casting process to assure you of a standard thickness. Each pack comes with finishing instructions, supplemented with the descriptions listed at the bottom of this page. All measurements are approximate, to the listed scale. Thus, an HO scale panel which is listed as 29' x 58' x 12" is just about four by eight inches and 1/8" thick or so. Panels are packed two ( 2 @ ), three ( 3 @ ), etc. 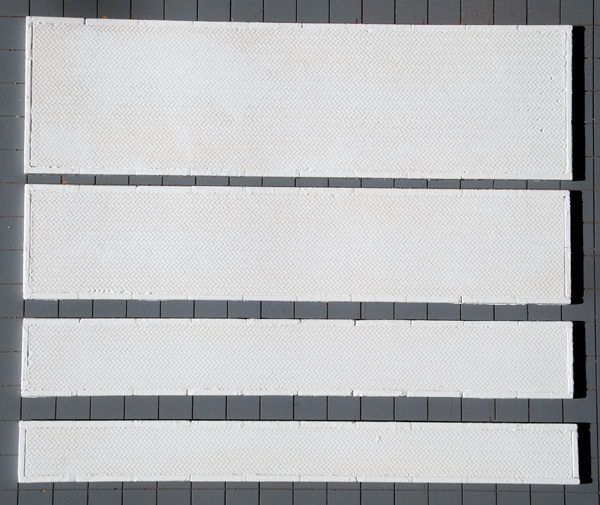 x 60' x 12" 7/8", 1-1/8", 1-5/8", 2-3/8"
Items marked 'to be announced' (TBA) are not currently available. To be honest I've had them on my list of things to do for years- so I would not hold my breath. Sizes show on this page are HO-scale which is 3.5 mm per foot. Actual panel size shown in inches. YOU CAN BUILD SOME COOL STUFF WITH THESE THINGS! These are the same building blocks I use to create the patterns for my kits. I take the pattern that I need, cut it up, add window and door openings, and sometimes, yes, I do fancy stuff to them, but without these stock panels I'd be lost. Pretty nice of me to share them with you, wouldn't you say? You don't have to do anything fancy. You can just use the concrete and stone for simple retaining walls, the herringbone brick for platforms, or maybe get brave and cut some of this stuff for a foundation or wall. Once you figure out how easy it is to work with and see the realistic results you'll want to do more and more. This should go without saying, but please, don't rip me off. Or anyone else for that matter. It's very tempting to make copies of someone else's work. Saves you lots of time and effort. The problem is your friends come over and see what a great job you've done and instead of showing them my web site you forgot to bookmark you get talked into making just a few more for them, their friends, the club, and Tommy down the road. Meanwhile me and my cat slowly starve. Then one day you wonder what ever happened to that guy who made all those cool patterns? All we have now is repeats of repeats. I know you wouldn't do this but a few years back I caught this idiot from Gresham, Oregon selling urethane knock-offs of my interlocking fractured stone castings at a swap meet down in Portland. I reconized them from across three isles. When I got to his table I couldn't believe my eyes. They were not my White Hydrocal castings but his urethane copies. He explained that the guy he bought them from said it was okay to make molds of them and sell them... Yeah, if you ask the right guy it's alright to rob a bank too. Here's my original pattern and the knock-off underneath. 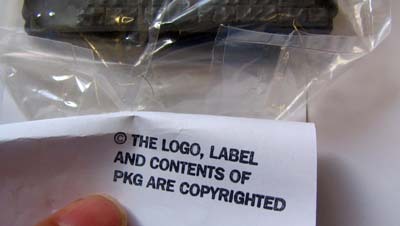 They even put their own copyright notice on the label! To make matters worse, even after a face to face scolding at the swap meet, a few months later I found the same items as well as illegal copies of other manufacturer's goods hanging in a Portland hobby shop. So much for the friendly warning. I work hard to create MY patterns and market them at a fair price. I'm trying to make an honest living and it is against the law to reproduce and sell them! I'm selling you the casting to build a model with. I'm not selling you the copyright to it. If you want to do that then MOVE TO RED CHINA! You can make all the copies you want there. Billions and billions of them. All patterns, drawings, photos and instructions are copyright C. C. Crow. Any reproduction of them in whole or in part is prohibited by law without my expressed written permission. Please respect the efforts of all manufacturers in this regard. I used to have a more casual stance to all this. Big deal if some guy makes a mold and then copies for his own use. However, as a spokesman for the hobby my offical stance must be hard against the practice of pirating. A couple years ago I noticed that a well known manufacturer was using some of my white metal patterns from Builders In Scale. When confronted the owner shrugged and said which ones are yours? His entire line of detail parts came from "the junk bin". He's still selling my chimneys as his own! Because of these and other events I must express a hard stance against all such piracy- even for personal use. And because of other bad experiences I DO NOT sell molds of my patterns nor do I license them. You can do it yourself. If you want to make your own castings, MAKE YOUR OWN PATTERNS, buy some rubber, and have at it, as explained in my How To Clinics listed below. Pay particular attention to the part about making your own patterns. The whole point of these How 2 clinics is to help you add to this great hobby. Hydrocal is great stuff. It's one weak spot is it will break. It is possible to fix broken pieces, often without it even being noticed. At least you can give it a try. Basic How To work with Hydrocal castings tips including the drops of water softening secret, cutting, filing and assembly, recomended glues. 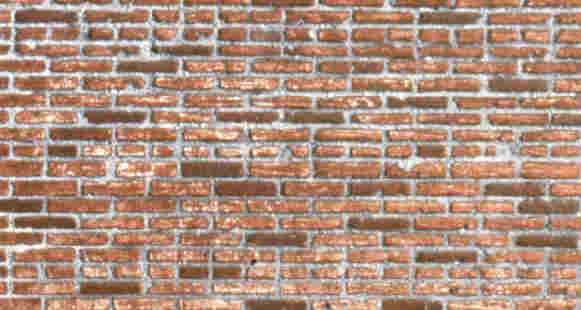 My favorite techniques for coloring brick. You will want to try my water putty mortaring. I'm told it looks pretty good! My favorite techniques for coloring stone. But what are we going to do now that Testors/Floquil has dropped their Flo-Stains? Coloring concrete is really simple. Coloring corrugated metal is simple too. Check out how I do it. Really the same as coloring concrete, it is simple. Check out how I do it. An overview of my pattern making techniques. This is the heart of my work. Once you have made your masters the next step is to make your molds. This is how I do it. Some simple do's and don't to help you avoid problems. Like bubbles, I hate bubbles! I am doing my own white metal and lost wax brass casting. Follow my journey to discovering these secrets. A look at how we make our lost-wax brass castings. And white metal detail production. Now that I have told you how to do everything you too can start your own model railroad structure kit business. Right? Not that I am a know-it-all but here are some helpful tips on photographing your models- at least the way I do it. Non-model railroaders often ask me questions about scale. Here's a quick overview.